This is just the sort of antique that we adore, quirky and one of a kind, craftsman made. This unique miniature table was produced in England in the roaring twenties in the year 1923 to be exact. This small round table was 'Presented to W. K. Dawson Esquire by The Round Table Circle Aug 3rd 1895 - 1920 Engineers Club'. The club was likely a predecessor to what we now know as the Round Table. Round Table organisation's have formed all across the globe and the Great Britain & Ireland Round Table was founded in 1927. The aim of the association is the encouragement of high ethical standards in commercial life, the promotion of fellowship amongst young professional and business people, and the quickening of individual interests in everything affecting the public welfare. The table is constructed from English oak with a lovely mellow coloring and fine aged patina (used by many a little child over the century). 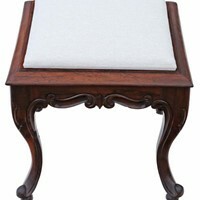 This item has been produced to the highest standard, the joinery and attention to detail is excellent. The central mounted solid sterling silver plaque is fully hallmarked with the anchor (Birmingham), lion passant (925 silver) and the date letter ‘y’ (1923). The plaque also features the manufactures initials ‘F. J & S’ which stand for F Johnson and Sons who was a Birmingham silversmith active during the late 19th/early 20th century. This is a unique, one of a kind item that has been produced to the highest quality by a talented craftsman. This would make the perfect accessory for a larger doll. Measuring: Diameter 5 7/8 inch (15 cm) by height 5 3/8 inch (13.5 cm). Condition: An old water mark to the table top, 1 inch wide shallow chip to edge of underside of table rim...see images.